After a horrible December and a rough start to the year, as if manna from Heaven the clouds parted and everything seemed good again. Not 2019 --- this was early February 2015. If there was a birth date for Janet Yellen’s “transitory” canard it surely came within this window. It didn’t matter that currencies had crashed and oil, too, or that central banks had been drawn into the fray in very unexpected ways. Actually, it did, at least with that last one. The world’s default setting remains central bankers. No matter how thoroughly they discredit themselves, in times of trouble people really, really want to believe there exists this technocratic savor. They can get it wrong time after time after time, but when things appear most dire it is almost like a defense mechanism this running back to “home” the Yellen’s, Bernanke’s, and Powell’s. The world looks like it is falling apart leading a central bank, any central bank to try something and for a time it appears to work. That was the winter and spring of 2015. After tremendous global upheaval, beginning in early February the BOND ROUT!!! was back on and Economists were all over the media pairing the “best jobs market in decades” with “oil price crash is a tax cut” nonsense. Relief was palpable. Even WTI rebounded sharply, from a low around $44 to back above $60 by May. 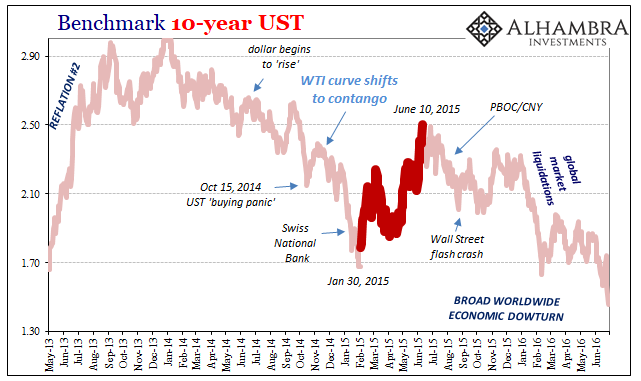 The UST 10s had been heavily bid, as they often are during these “unexpectedly” bad outbreaks, the yield falling sharply from about 2.40% in early November 2014 to a low around 1.70% at the end of January 2015. Long rates would retrace that entire decline and then some, arriving at 2.50% after nearly five months of cautious optimism. These countertrends can last that long. The pattern repeats time and again. In 2008, following the announcement of Bear Stearns’ near failure (of all things), the same process played out. Throughout the spring of that year, there was some level of speculation in markets that maybe, perhaps the Fed had finally caught up to the crash.